Publisher: Philadelphia : Edgewood Publishing Co.
lbatross ; of which three are foundprincipally in the seas of hot climates, and the fourth is confined totliose within the Antarctic Circle. Their bill is straight: the ujipermanolible hooked at the point; and the lower truncated, or appearingas if cut off. The nostrils are oval, wide, prominent, and lateral; thetongue is very small ; and the feet have each three toes, all placed ward. THE WAXDKRIXG ALBATROSS, OB MANOF-WAR BIRD. In size these birds are sometimes as large as a Swan. Their genera.color is white, the upper parts are marked with black lines. The quill 390 THE WANDERING ALBATROSS. feathers are black; and tlie tail is ronndecl, and of a lead color. Thebill is of a pale yellow, and the legs are flesh-colored. 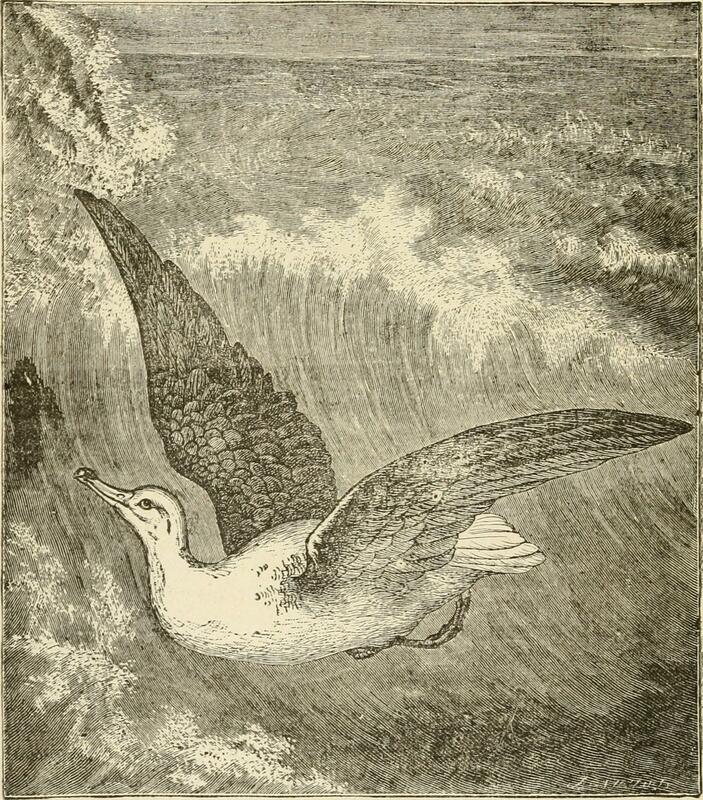 These birds are found in most seas, but chiefly in those within theTropics: they are, however, often seen about the Cape of Good Hope;and, towards the end of July, they collect in great numbers in Kamt-schatka, and the seas which separate that part of Asia from America.